AHOSI LLC PRESENTS THE FIRST EVER WIG SANITIZER. A NEW INNOVATION, PATENT PENDING, SPECIFICALLY FOR USE IN SANITIZING, CLEANING & REFRESHING WIGS, HAIR EXTENSIONS, BRAIDS & YOUR SCALP. United States of America, December 15th 2018 – AHOSI LLC aka AHOSI BEAUTY has created a new, innovative product, safe, made from natural ingredients – for sanitizing, cleaning, & refreshing wigs, hair extensions, braids, and it also helps to relieve scalp itch. Often, Women purchase wigs, hair extensions and wear them directly over their hair not knowing where they’ve come from, how they’ve been handled, if they contain germs, insects, ticks or anything that could cause long term harm to them. Our Wig Sanitizer is a product which kills 99.9% of germs, refreshes and cleanses the wigs so there’s no need to ruin the wigs by shampooing. With Women’s hair & overall health in mind, AHOSI BEAUTY has also created other hair care products from safe & natural ingredients. AHOSI Conditioning Oil & AHOSI Scalp Stimulating Oil are non-greasy, leave-in, non-messy hair products available to the public. A new study suggests that nearly 80 percent of hair products aimed at black women contain chemicals linked to cancer, infertility and obesity. 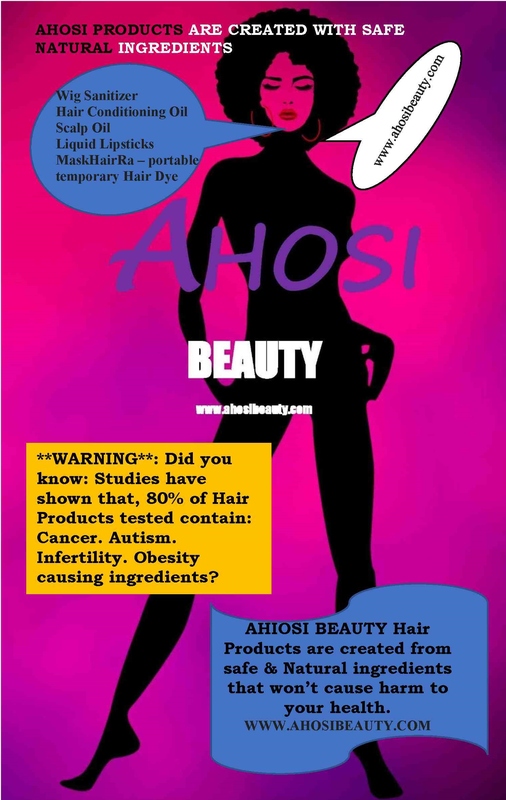 Ahosi Beauty products are designed with the user’ health in mind. With safe and natural ingredients, Users can be sure that our products will not cause any harm to their health.